The man by the stove is Isaac Gleason, the man in the background is Charles Lemmler, and the man left is unidentified. These two men ran a business important to the times. There were no cars only horse and buggy. Gleason and Lemmler were both well respected men who did a great service for the community. They ran their business out of an old section of Smethport referred to as "the stand." Vol. 1. Chicago: J. H. Beers & Co., 1890. P. 429-430. "MOST DISTINGUISHED CITIZEN FOR 1937." December 1938 McKean County Miner The many friends of Charles Lemmler, borough treasurer and prominent resident of Smethport for 62 years, were grieved to learn of his death which occurred Saturday afternoon at 4:15 o'clock at his home on Church Street, where he had been seriously ill for the past six weeks, following surgery in a Buffalo hospital, and in failing health for several years, but bravely carrying on his duties in spite of his poor health as long as he was able. The deceased was born in Boston, NY, March 14, 1854. 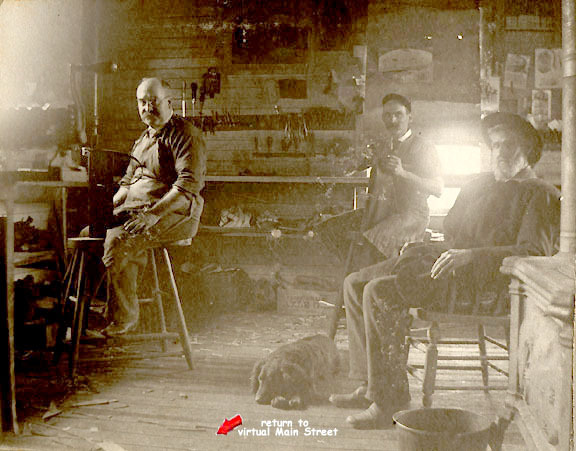 He came to Smethport in 1876 where he established a harness making shop and conducted a thriving business until January of 1933, when his store was destroyed by fire with a number of other buildings. He was considered an expert in the art of harness making and commanded a trade over a wide area. Mr. Lemmler served as borough treasurer from 1904 on, and received his appointment consecutively for 33 years. He missed serving only one year, 1912, after first receiving appointment to the position. distinguished citizen for 1937, a well deserved honor. Up until the time of his illness, citizens of the borough virtually set their clocks by his punctual arrival and departure at the hose house, where the borough treasurer's office has been situated since the big Smethport fire in 1933. The deceased was a man possessing many splendid characteristics, who will be greatly missed by his family and friends.